Just west of the Pennines, South Lancashire seethes with cities. We’re Manchester bound, although the route I take via the circling motorways is a bit, well, circuitous. Eventually I trust to luck, or instinct, following a long straight road that falls ever so slightly downhill. Despite a brief detour through a dodgy flats complex, courtesy of ubiquitous roadworks, I stumble upon Piccadilly Station, close to where we’re staying. Mind you, the rental company has changed its address without telling anyone, but we hunt it down eventually on the roof of a multi-story. Manchester has been compared to an incredibly vast shopping centre, where you never feel more than halfway towards the centre, ever. It does have its fair share of malls, not necessarily a bad thing. The point is that Manchester, like many new cities, is an urban conurbation – you can go city to city without leaving town. I figure we stayed in the centre, or high above it anyway. 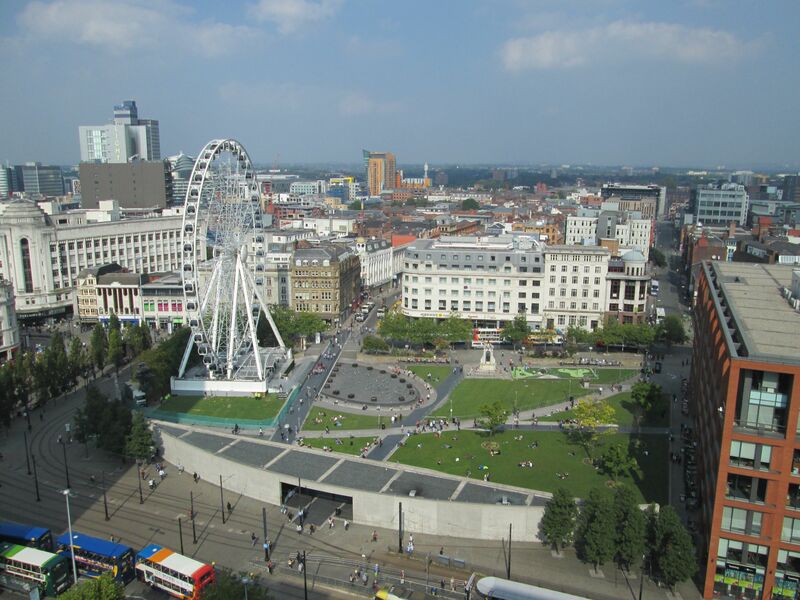 The hotel overlooks Piccadilly Gardens which pass for the town square. Here is the hub of the clanking tram system, Britain’s most extensive and a boon for the visitor or commuter. The Gardens itself is as ugly a slice of modernity as you are likely to see, its designer presumably antagonistic to the concept of parks, or people, or possibly both. Enter, if you dare, through the facsimile of an underpass; works wonders for the confidence that. What better place to lie in wait, slither out and importune strangers for money or drugs. We decide to give it a go. One step in, someone steps out of the shadows and importunes me for money. Disengaging from that, another approaches stage right. We give it a miss, retiring instead to the relative safety of the surrounds, a rather sleazy strip of downmarket dens. The name Piccadilly also denotes London’s centre, so what does it mean? The word supposedly derives from a collar of Spanish lace, a high fashion item in the sixteenth century. Perhaps an allusion to the parade of fashion common to a city centre. Manchester bustles more than it poses. There is a regular beat of footfall along with the throb of commerce. Plenty of shopping here, along straight, severe canyons and in extensive modern malls. 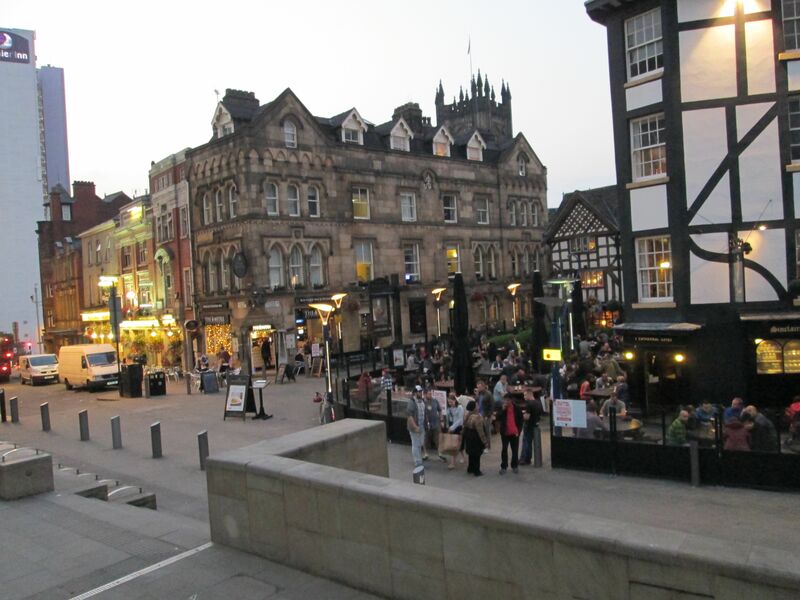 Manchester has been referred to as being about as beautiful as the back of a fridge. That’s a bit harsh. While there’s something functional, determinedly commercial, about the city, there are shards of beauty in its Victorian civic and industrial architecture. None finer than the Gothic extravagance of the City Hall. Palatial but, with an eye to the democracy it represents, accessible. You are free to enter, more detailed exploration by guided tour. An atmospheric restaurant peeps out of the cloistered entrance hall. Function rooms are available for those with a taste for the gothic. Both interior and exterior aspects are full of the beauties of fine craftsmanship, allied with the notion that buildings can be expressions of a higher ideal, that they can occupy the imagination as well as physical space. 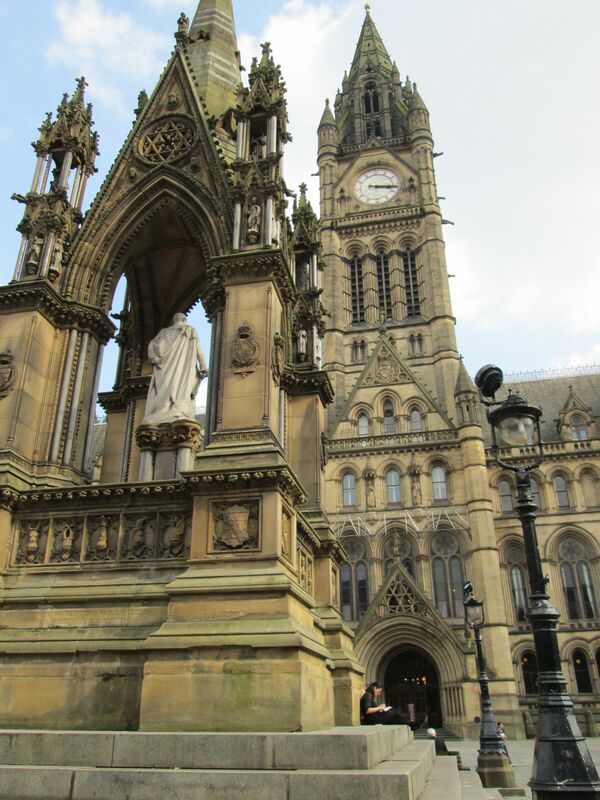 It dominates Albert Square, a surprisingly calm space boasting almost as many statues as people. While herself plunges into the sea of shopping, I linger in the square, The Chop House on the corner providing the oasis, a quiet pavement table with a view. We’ve arranged to meet at St Anne’s Square, a smaller, intimate space which also offers respite from the commuting and shopping throng. 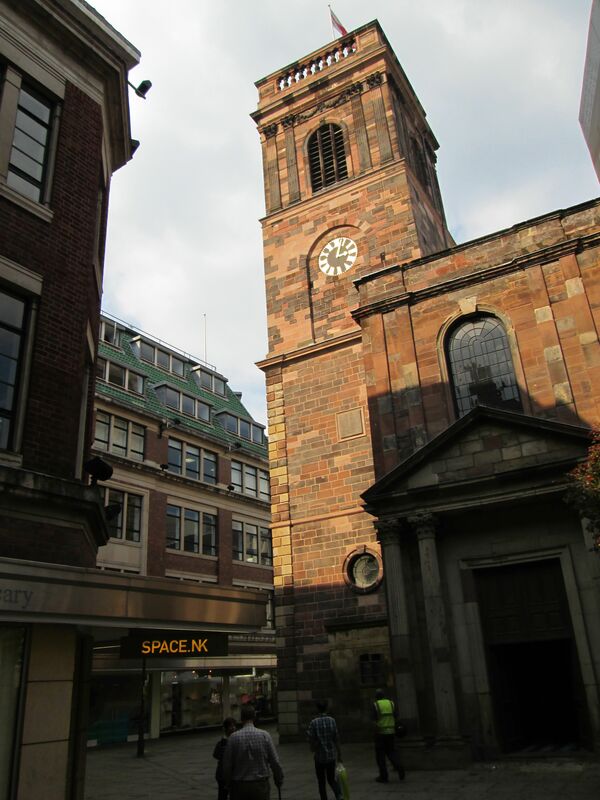 The old church that gives the square its name has been here since the eighteenth century when Manchester was still a small town. A feeling of more olden days pervades. There are market stalls, pub and restaurant marquees, and the right ambience to relax and watch the world go by. 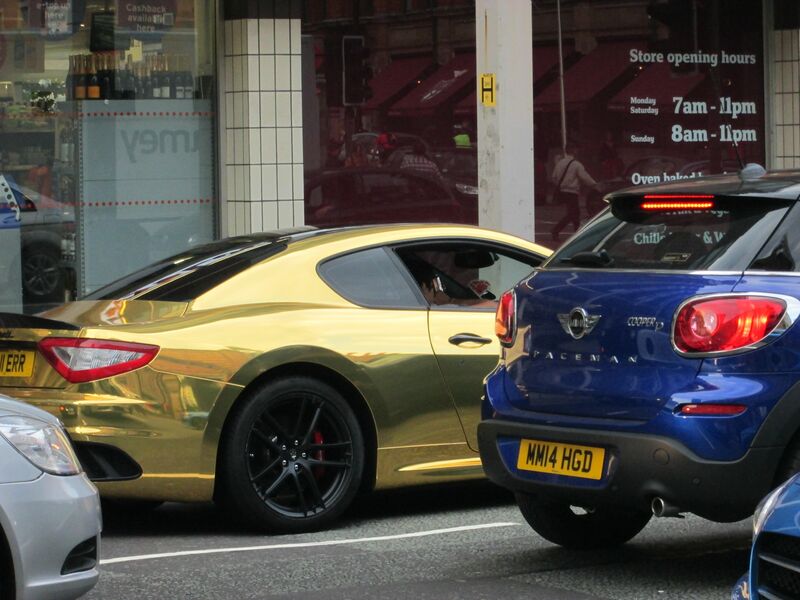 Manchester is really a modern city. It only received that designation in 1853, by which stage it was on the crest of the tidal wave wrought by the Industrial Revolution. Cotton was king, the city even nicknamed Cottonopolis. Warehouse City was another monicker, as the city flexed its industrial muscles to conjure up a Lowryesque landscape. The artist was a local, lived, studied and is buried here. The major museum in his honour, The Lowry, is housed nearby on the Salford Quays. Manchester, lest we forget, became a major port in the late nineteenth century. Over sixty miles from the sea, it was connected by the Ship Canal in 1894. Along Deansgate, you can catch the flavour of power that propelled this city into the twentieth century. Handsome proportions of streets and buildings, the Victorian and Edwardian palaces an impressive statement of wealth and craft. Not only God and Mammon, Manchester nurtured culture too. 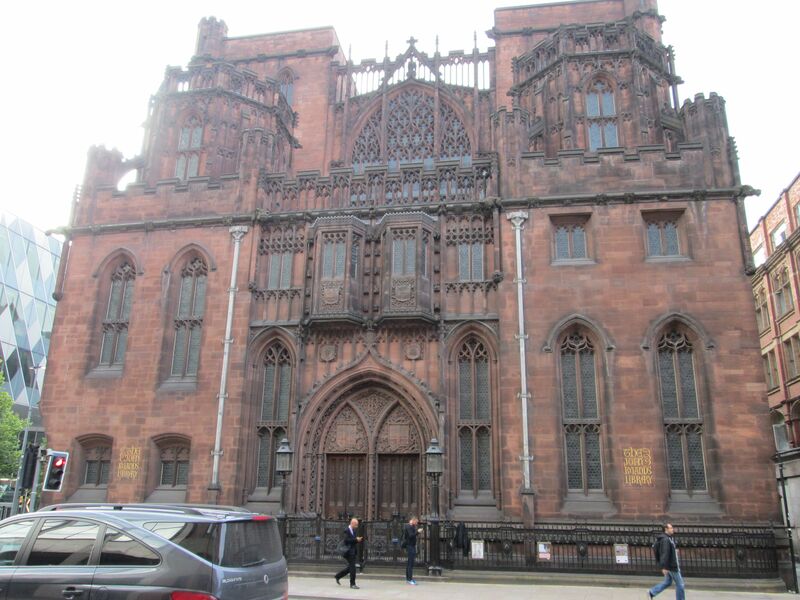 The John Rylands Library is a supreme Gothic confection from the early nineteen hundreds. It houses ancient papyrus and illuminated manuscripts, a Gutenberg bible and an extensive collection of the printing of Caxton. Beyond Deansgate lies the river and the great canal system. A city for exploration in itself. Hunger, for now, draws us back to the commercial hub. We dine at a high end pizzeria, and very nice it is too. This precinct has grown quieter at night but the atmosphere is good. Through a vast mall we find ourselves on a raised terrace with a view of Manchester Cathedral beyond. The Cathedral dates back to the fifteenth century though, like the city that now surrounds it, has undergone much change since. Below us is a lively spot, all mock tudor beams, called the Cathedral Gates. This is the place to be, with extensive outdoor seating and a great buzz. The medieval quarter, as such, straggles around here. There are guided walks to get you in touch with the original essence of the city. Every city comes from somewhere, you do want to keep that spirit alive. We wake to the incessant tinkle of trams. It’s all abuzz again. We take a tram to Piccadilly Station, heading for home via England’s extensive, if weirdly connected, rail system. We require three trains to get to Holyhead; a pity the ferry cannot sail from Manchester.